My husband and I are attending the Now I Lay Me Down To Sleep remembrance walk in Colorado this year. Our registration is paid and plane tickets are booked! I am getting more and more excited for the weekend that will be all about Caroline. We ordered custom tees yesterday that we will wear during the walk. They are awesome! On the front is a picture of the sun (which Caroline loved) with her name and “Beloved Daughter, Trisomy 13 Miracle.” On the back, we wrote, “Proud Parents Walking for Caroline and Trisomy 13 Awareness,” followed by a beautiful picture of our baby girl. We made sure to include that Caroline had Trisomy 13 both to raise awareness and in hopes of meeting other parents at the walk. I can’t wait for the shirts to come in! We are so thankful for the photographs taken by NILMDTS and the support they have provided. I am so grateful to the photographer who sat in the hospital waiting room at 3am waiting for Caroline to be born. The NILMDTS Facebook page has also been a great source of support in our grief. I anticipate that the walk will be lovely, and can’t wait to spend it honoring Caroline’s memory. We love you, Miss Caroline! Categories: Support, Trisomy 13 | Tags: love, memories, nilmdtsremembrancewalk, photographs, trisomy, trisomy 13 | Permalink. Caroline had a sweet demeanor. She was such a content baby, never fussing as she was passed from person to person. She loved to be cuddled and warm. She loved snuggling with mommy and daddy. As she grew, she became more alert and we got to know her beautiful blue-gray eyes. She explored the world around her with those eyes, and loved taking in the sights when we moved from room to room. We took pictures at home that captured Caroline’s alert moments in a way that no one else could. However, our amateur photos had lighting and color issues that could use a professional’s touch. We decided to have a photographer professionally edit our favorite photos taken at home. 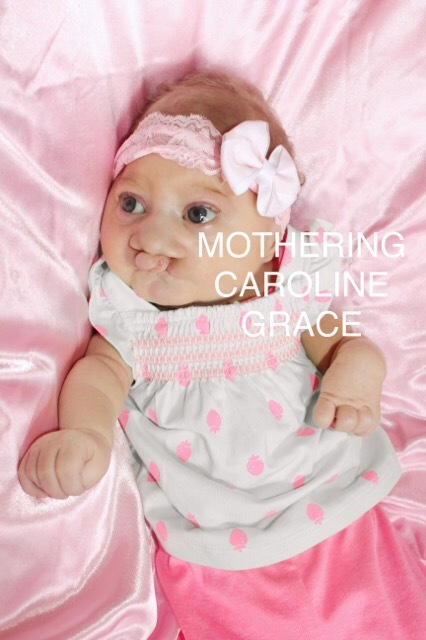 She went beyond our expectations by removing Caroline’s feeding tube from some of her pictures. Caroline hated that feeding tube. The edited pictures now capture Caroline’s free spirit in a way that you could not see with that plastic tube taped to her cheek or her chin. I am very protective of my pictures of Caroline. Second to my memories, they are the firmest link to my time with the sweetest baby in the world. I find myself looking at this picture often every day, still amazed at the beautiful miracle I was blessed to meet. Through this photograph I can feel the love in her eyes and remember how it felt to stroke her hair and kiss her forehead. Every day apart is impossibly hard, but I am so honored to be Caroline’s mom and wouldn’t trade it for anything. Her sweet soul inspires me every moment of every day. Categories: Memory Monday | Tags: love, miracle, pictures, sweet soul, trisomy, trisomy 13 | Permalink. Caroline had an extra pinky on each hand. When our maternal fetal medicine doctor saw the extra fingers on ultrasound and pointed them out, I was shocked and scared of how her hands would look. I didn’t know how beautiful six fingers could be. Caroline’s right hand had the classic trisomy clenched fist. Her left hand was different; her fingers were always curled but never clenched, and her fingers did not overlap on that side. My favorite view of Caroline’s perfect hands was when she reached towards me. I’d then pick her up and those beautiful hands would soon relax, opening from their usual position. Oh how she loved being in mommy and daddy’s arms! Categories: Memory Monday, Uncategorized | Tags: hands, love, trisomy, trisomy 13 | Permalink. It was familiar, but I was surprised how quickly I had forgotten the details. Large oil paintings in bright colors lined a long, winding hallway. We had to walk down this hallway to get to our appointment. The colors seemed a little brighter this time. Yesterday, my husband and I drove into the city for our final appointment concerning Caroline. We decided against an amniocentesis during my pregnancy, and instead had diagnostic chromosome testing done at Caroline’s birth. We got the phone call from my OB’s office a few weeks later to tell us that Caroline did have Trisomy 13. In the moment, I didn’t ask any questions or need to know more. Whether or not we were genetically predisposed to Trisomy 13 had no impact on taking care of our precious baby girl. Now, our priorities have shifted and we decided it was time to review the results and our risk for a future baby to have trisomy. I finally made the appointment to go back to the city for genetic counseling, to go over Caroline’s results. I had nerves all morning. We were going back to the office where a genetic counselor first broke the news to us that our child had Trisomy 18 or 13, and was not likely to survive. Being back in that office put me on edge, and I sat in the waiting room with my arms crossed, looking very uncomfortable. I was. We were finally called back, into the same conference room where our hopes and dreams had been destroyed. The genetic counselor that we saw was not the same person that we saw when we were pregnant with Caroline. She started by asking us about our time with Caroline. It had been a long time since I’d told her story from start to finish to a new person, but it felt so good to do so, even with tears. She then took the time to look at the book of pictures that I brought with me. We know that the time that Caroline spent with us was truly a miracle and she was the exception rather than the rule, so it was nice to show this woman that babies with Trisomy 13 can live. Caroline lived for a short time, but that doesn’t make her any less of a person. In fact, I think it makes her more of a person. We then talked about the results. The cells that were analyzed all showed full Trisomy 13, meaning that it is the type that happens randomly and is not inherited. This means that our recurrence risk is about 1%. This looks like a great number, but when you’ve already been in the 1% category, you start to lose faith in statistics. However, moving forward, we now know that we are not putting future children at an unreasonable risk for trisomy. We hope to have more children someday. One thing that meant the world to me was that our genetic counselor treated Caroline as a person. She used her name throughout the appointment and celebrated her life with us. On our way out, I gave a copy of Caroline’s picture to the genetic counselor, her student, and the receptionist in the office. The genetic counselors were thrilled to have a picture of Caroline, and I was happy that their image of Trisomy 13 would go beyond what they saw in textbooks. 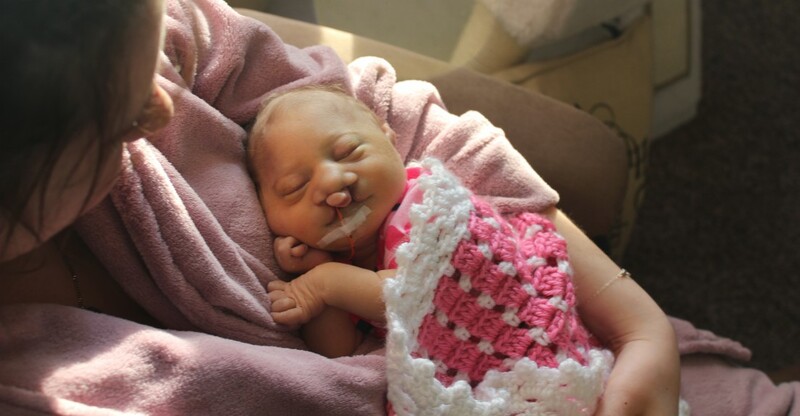 They would know that every baby presents with Trisomy 13 in different ways, and remember how our little girl beat every odd to spend time at home with her family. When I gave a copy to the receptionist, she broke into tears and said that looking at Caroline’s picture will remind her how precious life is and help her through her hard day. I told her that Caroline is our miracle. She was so sweet, and I was amazed at the way that Caroline’s picture was able to move people. Leaving that office for hopefully the last time, I felt a sense of relief as we passed through the winding hallway. Instead of evoking memories of pain, it has softened to evoke memories of all the people in that office that have loved Caroline. She continues to inspire everyone who hears her story. Caroline, you amaze me every single day. I love, love, love you. Categories: Trisomy 13 | Tags: genetic counseling, life, love, pictures, recurrence risk, trisomy, trisomy 13 | Permalink. When Caroline came home from the hospital, she was completely stable. That first week, her hospice nurses came by every day to check Caroline’s vitals, and every day they were stable. They continued this way, so we cut down our hospice nurse visits to 3 times a week. I remember the day that Caroline left stability like it was yesterday. It was May 2nd. I had planned to leave Caroline with her grandmother that morning for an hour or two to go in to work for a seminar. I never made it. I had a tough morning of a fussy baby girl and noticeable changes. That day, her hands were much colder to the touch than they had been before. I also noticed that her feet were slightly swollen. This was the first time that Caroline had shown any change since coming home from the hospital, and it was a change predicted by the cardiologists that we had seen in the past. Up until this point, a part of me still believed that there was a chance of Caroline’s heart healing itself. She had done much better than expected so far, why wouldn’t it continue? What Caroline’s nurse said was true, but there was a deeper yearning meant by my comment. It felt horrible to be in the position I was in, where there was no cure for my daughter’s condition and I was completely helpless. There was nothing I could do for her other than keep her comfortable. I didn’t want her to suffer. As a parent, it just feels wrong, even when you know you are doing the best you can for your child and your family. I have no regrets about the decisions that we made for Caroline, but that did not make them easy. Caroline’s change in status made it all very real, and brought many tears the next few days. Now that she was showing symptoms of her heart condition, I feared that we would lose her very soon. Once again, Caroline defied the odds. She remained happy and stable with us for almost another month. In fact, the week that she passed away, there were a few days where her swelling had completely disappeared. The day that she passed away, her vitals were stable during her nurse visit and her lungs remained clear, as they had always been. I am so thankful for the time that we were given with Caroline, and that she was so comfortable with little use of pain medication. We were able to see her sweet personality and she was able to spend quality time with her family. There would be many more tears to follow May 2nd, but those tears were always and will always be tears of love. Categories: Memory Monday | Tags: CHD, hospice, love, nurse, parent, swelling, tears, trisomy, trisomy 13 | Permalink. Caroline played with her hands. When we came home from the hospital, we’d first wrap her up like a little burrito, which she loved. Soon enough, she began exploring her limbs and wanted to be more free. My husband would lie on the couch with Caroline on his chest, and she would use her hands to prop up her head in a sweet, sleepy in class kind of way. She discovered them and explored them. Although her hands were clenched shut most of the time, when she was very relaxed her palms would open. It always made me smile to see her hands so relaxed, because I knew how happy and relaxed she was for them to be that way. Once, Caroline found a finger and sucked on it. We took a video of her doing it – she was always amazing us. It was so adorable – the fact that she had 6 fingers made it look like she was sucking on air, but she got that index finger in her mouth and did something that so many babies do. It made her so happy. At about six weeks old, we had to start putting mittens on Caroline’s hands to keep them warm. Her hands were cold because of her poor circulation. I was sad to take her beautiful, six-fingered hands away from her but knew that she needed her mittens. Caroline received the sacrament of Annointing of the Sick. Part of the sacrament involves blessed oil on the palm of the hand. I smile when I remember our priest trying to open Caroline’s hand, and having to tell him that they don’t open on command – he would have to improvise. I held those beautiful hands the night that Caroline went to heaven. For hours I held her hand. Emotionally I will never let go. Categories: Memory Monday | Tags: hands, happy, heaven, mittens, relaxed, sacrament, trisomy, trisomy 13 | Permalink. After Caroline was born, doctors told us that the first 24-48 hours would be telling. Changes happen with the heart after birth that were likely to be severe for Caroline. However, she remained stable through that time. This was one of many, many miracles that we saw because of her. I had written in our birth plan for Caroline’s heart defect to be confirmed if she lived longer than expected. We reached that point, but then became uncertain when asked if we still wanted the test done. The doctors thought that the prenatal testing was valid and were not sure what we would gain by having the test repeated. We decided to take Caroline home, love on her, and decide about the heart echocardiogram later. At two weeks old, we decided after much deliberation to schedule Caroline’s echo. We wondered how it was possible that she was still doing so well, and suspected that her heart defect was not as severe as thought prenatally. We didn’t want to put Caroline through any more tests than were necessary, but this one was not invasive and would let us know what was going on and if we needed to make any changes to her treatment. The deciding factor for me was when I asked her pediatrician if she felt comfortable treating Caroline’s symptoms without input from cardiology, and she said that she would feel much more comfortable if they were consulting on her case. It was time to find out what was happening with Caroline’s heart. We took Caroline, all bundled up, to the hospital for the test. I remember it being a very windy day. We covered Caroline’s car seat in her pink blanket with ballet slippers printed on it. We arrived early and got inside quickly with her stroller to escape the wind. Before Caroline’s appointment, we planned to visit the nurses who had taken care of us weeks before on the labor and delivery floor. They were all amazed at how much Caroline was eating (15 ml every 3-4 hours if I remember correctly) and how well she was doing. She followed them with her eyes as they swarmed around her, taking in the miracle baby. We took pictures with the nurses and it was another one of those moments that validated me as a mom; I got to show off my precious newborn and have her met with nothing but smiles. I am so glad that Caroline got to see all those smiles. We then went back to the outpatient wing for Caroline’s echo. They gave me a hospital wristband for her when we checked in, but since she was so small they told me to just hold onto it. We were soon called back for the echo. Two women performed Caroline’s scan, and the results were then sent to a local children’s hospital so that a pediatric cardiologist could read them. Caroline LOVED the warm gel on her chest. As the tech performed the heart ultrasound, she fell asleep on her mommy. The tech commented that Caroline was the most well-behaved baby she had ever had for the test – most babies end up screaming and protesting. Caroline was so easygoing and sweet. The test took much longer than expected, so Caroline’s daddy had to leave for work before they gave the results. I talked to the cardiologist and found out that Caroline still had a double-outlet right ventricle (DORV) heart as well as complex problems with her circulation. I had some hope that the scan would show us that Caroline’s heart was healing, but those hopes were shattered. Even so, I felt better knowing the situation and having cardiology in on the conversation of how to manage Caroline’s symptoms. We took our daughter home and spent another amazing month with her. I say this all the time, but everything about Caroline was a miracle. It was easy to get discouraged and sad, knowing that your child has a condition with no cure and that any second could be her last. However, God and Caroline kept me going through all of the tough decisions and heartache. Having the chance to love Caroline was worth every second of heartache. Being her mom is the best. Categories: Memory Monday | Tags: cardiology, DORV, echo, heart, heart defect, hospital, love, miracle, miracle baby, mom, nurses, trisomy, trisomy 13 | Permalink.